In our podcast, The Big One: Your Survival Guide, we explained how a major San Andreas earthquake could cause thousands of fires, collapsed buildings, and a loss of water, electricity and communications. It means we've all got to consider what needs to be done to prepare, and if you're among the one in four adults in the U.S. who live with a disability, prep can be even more complicated. Some podcast listeners reached out to us to ask us about this — specifically, what to do to if you, a family member or a friend is disabled. FEMA says to: "Base your plan on your lowest level of functioning." Anticipate that everything that could go wrong, will go wrong. Have supplies and a plan in place to respond quickly if necessary. "You've got to know what you need," said Vance Taylor, chief of the Office of Access and Functional Needs at the Governor's Office of Emergency Services. For instance - if you have machines that run off electricity, consider what your backup source of power is going to be. Do you have ample backup batteries? Or do you need a generator? If you use an electric wheelchair, do you have a manual wheelchair just in case? If not, consider the fact that you're going to have to get to a shelter when they're established (after a day or two). Figure out how you're going to get there, as that's where they should have the necessary equipment to help you. "If you don't have that information with you, it makes it very difficult to ensure that you get all of the services and resources that are going to be required to make sure your needs are met," said Taylor. If you need things like oxygen or medication, remember that you may not be able to get a hold of supplies for a few days. Make sure you have extra, as well as a way to store them, especially if they need to be refrigerated and the electricity is out. If you might have trouble navigating your home after furniture and other items move, consider securing things to keep them from shifting. You can use furniture straps for big items, or earthquake putty for small objects. You can drill picture frames into walls and put locks on cabinets to keep dishes from flying out. Do everything you can to keep the chaos inside your home to a minimum. 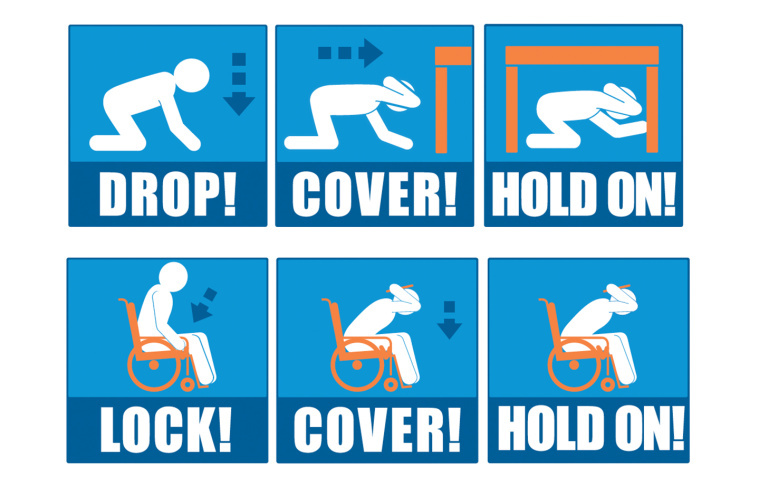 In the event of an earthquake, assume that you'll be sheltering in place, unless your structure is compromised or you need to head to a shelter for help. Get an emergency radio to listen for evacuation notices in case the internet and electricity are out. "The one thing I tell people with disabilities is we don't have the same luxury of waiting as our non-disabled counterparts do," said Taylor. "The reality is once you get that notice, you've got to go. Because it takes us so much longer to evacuate, because by the time we see the flames, I'd say it's too late. We can't just hop in our car and drive away." "We strongly encourage people to plan as though no help is coming to get you," said Marcie Roth, CEO of the Partnership for Inclusive Disaster Strategies. "For many people that means having redundancy plans, not just simply having a buddy." "I tell people to plan four people deep," said Taylor. Make plans in advance with family members, friends and neighbors. You want people you can trust to check in on you after the disaster — people who could help you evacuate (if necessary), particularly if you have access and functional needs. "Stigma and bias are often two of our biggest challenges," said Roth. "People make assumptions that we need to be taken care of, rather than engaging us as partners in planning." Work together to figure out what supplies you'll need to take with you and where they're located, as well as how you're going to get out of the building. Practice if you can. Since cell networks could be down, consider paying for a landline so that you can get in touch with people to let them know you're OK.
You can't rely on emergency services to come help you, as they'll likely be overwhelmed by the number of requests coming in. And the city of L.A. does not maintain a registry of people with disabilities, so they don't know you're out there. They're not going to check in on you. If you need non-medical help, seek out an emergency shelter, as hospitals are likely to be overwhelmed. To find one, you can either visit the Red Cross's website (if possible) or dial 311 in L.A.
Also know that any designated public shelter has to comply with the Americans with Disabilities Act, which means that they have to accept service animals as well. This is just a jumping off point and there's a lot more to consider. Here are some additional resources. The Red Cross's "Disaster Safety for People with Disabilities" guides you through creating a personal support network, completing a personal assessment and making an emergency plan. California's Office of Emergency Services has resources that Marcie Roth is a fan of. They have an Access and Functional Needs library, meant to help people in California. The Earthquake Country Alliance has a page of resources that specifically focuses on preparing for earthquakes. FEMA's got some good resources, including the comprehensive PDF, "Preparing for Disaster for People with Disabilities and other Special Needs." If you're in Los Angeles, you can also reach out to the L.A. City Department on Disability with further questions.